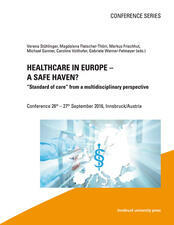 Healthcare in Europe – a safe haven? Against the background of increasing healthcare costs and the economic crisis, health systems in Europe face major challenges. Providing innovative personalized treatments to European citizens, as well as increasing healthcare needs of ageing societies will further intensify this situation. In this context, cross-border healthcare can be seen as a chance for states to better coordinate specialised treatment centres which offer necessary innovative and high quality but expensive care. Recent developments (e.g. migration) or biomedical advancement, (e.g. in reproductive care) thereby influence the standard of care each state is willing to provide, while legal developments and human rights can further determine what states have to provide. • Which standard of care do countries have to provide to their citizens from a (bio)medical, legal and ethical perspective? • Which standard of care is required by law of the European Union (EU), the Council of Europe, or by national constitutional law? • Which role does healthcare rationing and cost-effectiveness play in the decision process? • Above all, is it possible to define a standard of care and how do human rights influence this standard? • Do we have to adapt this standard of care due to ageing societies? • How could innovative but expensive treatments, that provide patient-relevant benefits, enhance access to affordable care and what role does HTA play in this context? • Which standard of care do patients expect? • What does this mean for the situation of patients receiving highly innovative medical treatment abroad, and who then face discrimination or a lack of treatment supply after returning to their home countries?